4. What's Wrong With That? 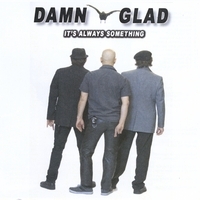 The NYC power trio rock group DAMN GLAD is set to release their 3rd album "It's Always Something" in January 2013 via ITunes and other major online retail outlets. "Third album is the charm" says singer/guitarist/songwriter Matt Kurzban. "This is DG's best album to date and we had a great time as a band making this record and self producing ourselves along the way". The title of the album obviously reflects true to DG's philosophy. Stay on your toes because as soon as you get comfortable or feel secure, something comes along to remind you that life will have it's way with you. Hence the the title "It's Always Something". Say this phrase out loud when something goes awry and you will instantly feel better about things. Accepting the notion that life isn't easy makes it easier by not expecting ease. Make sense? INGREDIENTS: High energy and personality is DG's formula for putting on a show worth mention. The driving guitars, infectious grooves and memorable melodies/harmonies distinguish their sound as a power trio keeping it real. No gimmicks. Just catchy, driving rock with attitude! DG's new album "It's Always Something" is powerful and honest. The way great rock bands used to be! The shine doesn't wear off of DG with songs ranging from tough grooving toe tappers, soulful ballads to dark melodic rockers.